Acme Thunderer Metal Whistle #60 1/2 Nickel Plated Brass. $8.95. "They are the best whistles out on the market"
Tremendous power and sound. Plain and Simple? It just works. I use it with the whistle tip guard which makes it very comfortable to hold in the mouth. Acme is the world's best without question. "I have been using this whistle to train my retrievers for 40 years." I have been using this whistle to train my retrievers for 40 years. Still have the original I purchased in 1975. That's durability! "Acme Thunderer is a great product." No dogs; just whistles. Acme Thunderer is a great product. "High quality LOUD whistle. Bye-bye coyote!!" High quality LOUD whistle. Bye-bye coyote!! "Very good product, well made and sounds great." Very good product, well made and sounds great. "Very loud whistle and easy to handle and manage." 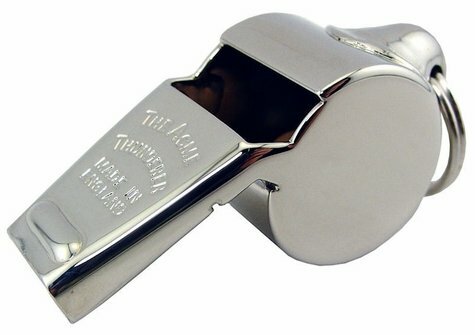 Very loud whistle and easy to handle and manage. I use these whistles for a staff of lifeguards. They are durable, loud, and yet comfortable in size to wear around one's neck all day on a lanyard. "I have used Acme whistles for over 30 years and find the product good, but the one I bought is a lot higher pitched than what I am used to when hunting in field conditions." I thought this would be a larger whistle like the one I have now that is inoperable due to the cork-pea swelled. I have used Acme whistles for over 30 years and find the product good, but the one I bought is a lot higher pitched than what I am used to when hunting in field conditions. Too loud for me. Rings my ears. The smallest, shrillest, most popular whistle of the Acme Thunderer range. This whistle is nickel plated brass. The Whistle Tip Guard fits this whistle. Click here to Hear this Whistle. Country of Origin: Made in UK.